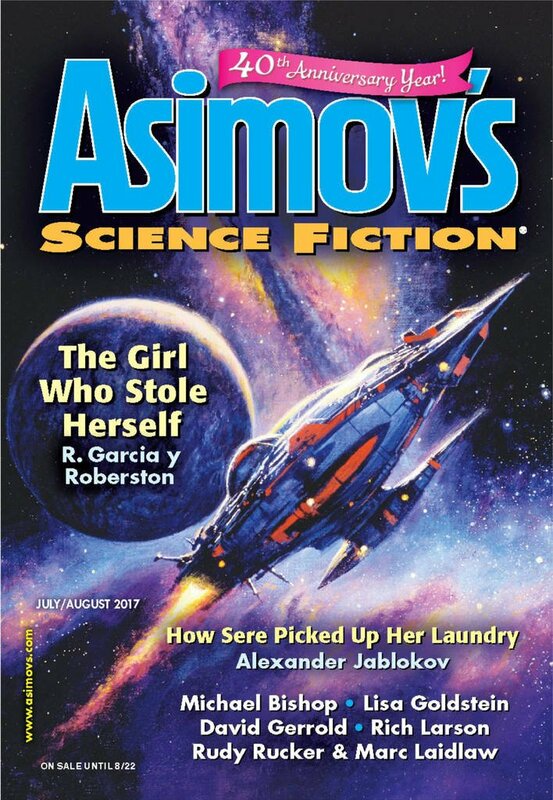 "How Sere Picked Up Her Laundry," by Alexander Jablokov [bio] (edited by Sheila Williams), appeared in Asimov's Science Fiction issue 07-08|17, published on June 15, 2017 by Penny Publications. Pro: : In terms of plot, the story is straightforward: Sere needs to find out who is using the tunnels and what really happened to the exterminator. On a larger scale, she’s getting herself back on her feet, finding new clients and partners, and restoring her own self-confidence. She takes big risks, but she succeeds on all counts. Her success is well-earned, and the story is very satisfying. Secondary plots and agendas abound. Most importantly, Mirquell has her own fortune to restore, and getting close to the Case is key to it. The details of the mystery, the false leads, the clues are a big part of what makes the story fun. We’re sure the invulnerable insects are important, but it’s a long time before we figure them out, and it’s very gratifying when we do. The setting itself makes the story rich and complex. We have no idea why humans are refugees on this planet—so far away in time and space that no one ever mentions Earth at all—but the exotic architecture, the strange technology, the twin stars, and the aliens themselves all combine to create an exotic atmosphere. Sere and Mirquel are great characters, and the way they play off each other is entertaining. The soot is a vicious carnivore, yet somehow it’s endearing too. And, of course, the action has plenty of edge-of-the-seat thrills, chills, and excitement. Con: The plot and setting are so rich that it’s easy to get confused. When Mirquell gives a recap of Sere’s discoveries, we’re actually grateful for it. It’s surprising that the Case are so powerful and yet can’t afford equipment to delouse their pets. Although the characters are well-developed, there isn’t much emotional content to the story. This one was a slog for me. Just a long string of vignettes showing the various peoples of the city. I didn't care about the characters, and the mystery wasn't compelling. Yeah, to like this story you really have to like the characters and have some interest in the mystery. The setting is interesting, but not enough to carry the story by itself.